The in vitro production of doubled haploid plants through androgenesis (anther and microspore culture) is an efficient system for the production of fully homozygous plants rapidly. To date, anther and microspore cultures are commonly used to accelerate breeding in a number of cereals and other crop species. Traditionally, plant breeders achieve homozygosity by using self-fertilization or backcrossing, which is a time consuming process. Significant advantage is that the system not only speeds up the process to obtain homozygosity, but also increases the selection efficiency. Doubled haploid plants are genetically normal and phenotypically stable. Abiotic stresses showed adverse effects on the growth of plants and the productivity of crops, thus resulting in significant economic losses worldwide. Conventional plant breeding is being employed to develop varieties resistant to abiotic stresses, but progress has been slow. There is a great need to exploit all genetic variabilities that can be used in breeding in adverse environmental conditions. Use of unconventional techniques, such as doubled haploid (DH) breeding through androgenesis will become more useful to speed up the application of conventional plant breeding methods. Genetic transformation is a novel approach for plant molecular genetics and breeding. This system offers an attractive alternative to conventional breeding programs because it can allow specific traits to be transferred into selected genotypes without adversely affecting their desirable genetic background. Till now, there are some reports using desirable genes to obtain stress tolerance transgenic plants with various transformation systems. There are some reports using explants directly to isolated microspores, protoplast isolation for microspore-derived suspension culture, anther and microspore-derived embryos for rapid production of transgenic fertile plants. 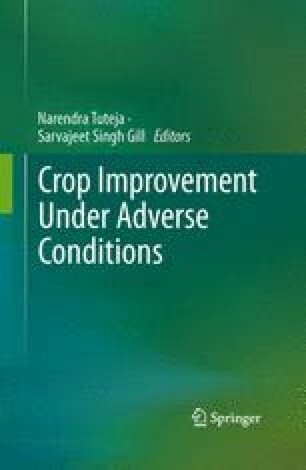 However, this report mainly highlights the need to develop abiotic stress tolerance fertile transgenic plants, especially in cereal crops through androgenesis and genetic transformation system.